Besieged with requests for lectures on his latest breakthroughs, L. Ron Hubbard replied with everything they wanted and more at the Second Annual Conference of Dianetic Auditors. Describing the technology that lies behind the self-processing steps of the Handbook—here is the how and why of it all: the discovery of Life Continuum—the mechanism by which an individual is compelled to carry on the life of another deceased or departed individual, generating in his own body the infirmities and mannerisms of the departed. Combined with auditor instruction on use of the Chart of Attitudes in determining how to enter every case at the proper gradient, here, too, are directions for dissemination of the Handbook and hence, the means to begin wide-scale clearing. As 1951 drew to a close, Mr. Hubbard’s research into the human mind was advancing by exponential leaps. Having isolated the three case factors which hold aberration in place, THOUGHT, EMOTION and EFFORT, he had developed the processing regimen to address them: ADVANCED PROCEDURE. With this, the subject had entered what Ron called a “second echelon,” one dealing not with the mechanics of mental image pictures, but with the postulates and decisions of the individual. At the Dianetics Foundation in Wichita, Kansas, letters flooded in from auditors applying these new breakthroughs, all telling the same story: a significant increase in auditing success. 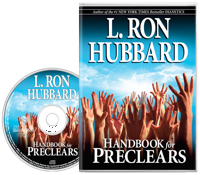 With results in hand, L. Ron Hubbard turned to the next task—how to make this technology broadly available to preclears at a whole new order of magnitude. In other words, how to audit the numbers requisite to speed planetary clearing. By December, his plan for this next phase was in place. So came Ron’s invitation to Dianetics auditors for a conference in Wichita between Christmas and New Year’s Day. With enrollment exceeding the facilities at the Foundation, the Crystal Room at Wichita’s Shirkmere Hotel was secured for the occasion. 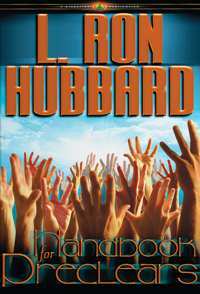 And on 27 December, Ron began the Second Annual Conference of Hubbard Dianetics Auditors with what was to be the textbook of the Conference and the heart of his plan—Handbook for Preclears, a companion to Advanced Procedure and Axioms, for use in self-processing. Behind the workability of the Handbook and woven into every process was a newly discovered phenomenon—the Life Continuum, a mechanism by which an individual carries on the life of another who has died, departed or failed, by assuming their attitudes, illnesses and aberrations. So remarkable was this discovery in application that the Foundation was soon abuzz with daily miracles. Moreover, and quite in addition to the miracle results the book provided, its centerpiece was another milestone development applicable to all processing—the Hubbard Chart of Attitudes, plotting one’s attitudes and reactions to life, and postulating an Ideal State of Man. As a character index chart, one could now spot a person’s attitudes and thus rapidly find their position on the Hubbard Chart of Human Evaluation in Science of Survival. Finally, after detailing exactly how auditors could disseminate the Handbook on a massive scale to the result of widespread application, Mr. Hubbard next gave attendees a glimpse of where his research was now heading. That is, having found the Life Continuum and why a person lives the lives of others, he was now exploring the many earlier lives on the whole track—thereby moving into a “third echelon,” beyond the realms of one body, one life. 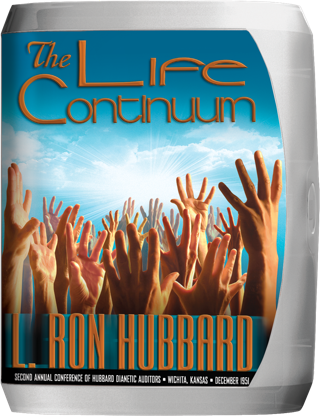 Thus, this pivotal event stands as L. Ron Hubbard’s first introduction to the subject that would embrace this vast new horizon—Scientology. In full, then, these celebrated lectures represent nothing less than the evolution from the heights of Dianetics development to the dawn of Scientology.